At long last, Bloodline is getting a book! Pre-orders are open until the end of may at a discounted price. You can get a regular copy, a signed copy, or one of the first 30 numbered copies (Signed and with a quick sketch). 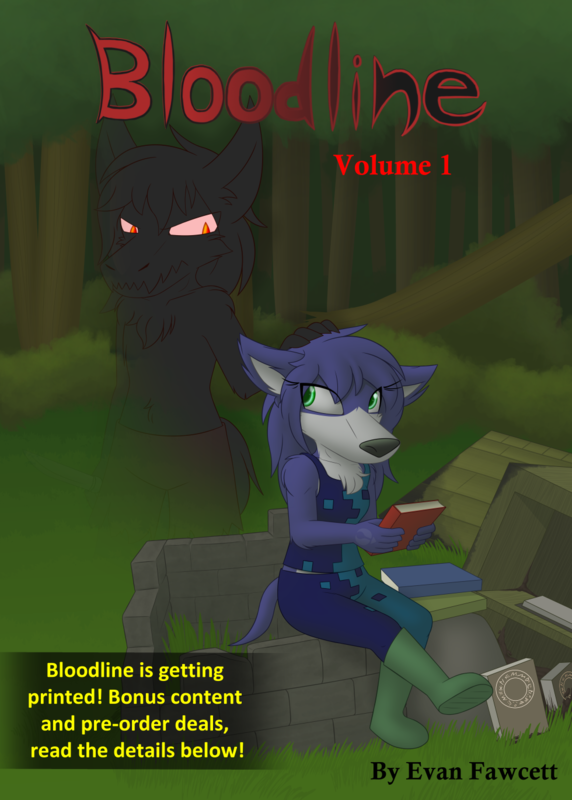 The book itself contains chapter 1 of Bloodline (100 pages) plus several bonus comic pages exclusive to the book! The pre-orders really help me out with the printing costs, so a big thank you to those of you who decide to get your books early! I’d put a link to where people can pre-order the book in your post, if I were you. Don’t see the point of it, I usually just go by my pen name online. Hey great job! good to see that you’ve been doing well enough to have this story printed. Super excited to see more of this world. Yeah, I wish I could do more to get international shipping costs down. Maybe in the future, more options will open up to me. But thank you for pre-ordering a book, it really helps me out a lot!